If we're honest, I think we’ve all had at least of these one moments – I know personally I’ve had a LOT of them! In these ‘wobble’ moments we can feel lost, demotivated and even depressed; feelings that no one enjoys. So it’s important to find a way to move out of self-doubt as quickly as possible, regain our confidence and sense of purpose and start moving forward towards our goals and back to happiness. Here are some strategies for overcoming self-doubt that have worked well for me. The next time you have a wobble, try them out and see which ones work best for you – you might even find that approaches suit different wobbles. If you have any additional experiences or tips to share, then add them in the comments below, I’d love to hear them! Self-doubt often creeps in when we lose sight of our purpose. So take a moment to think back to why you started your business in the first place. Being an entrepreneur or business owner is a journey. So it's perfectly normal to have days when or when nothing goes right and your motivation takes a nose-dive. Having this clear sense of purpose can make it much easier for you navigate these days and move forward. Getting clear about exactly 'Why' you are in business and what you want it to do for you and society is an important first step for every business owner. Read Why your business journey needs to start with Why for more tips on this. Your self-doubt may stem from a plan that no longer feels fit for purpose. Perhaps you or your business have moved on; maybe your situation has changed, or perhaps it’s simply time to shake things up a bit. Go back to your goals and Why, and start working through how you want to get there given your current situation and knowledge. A new plan of action can help bring back the excitement into your work and help you get refocused and energised. When we feel a bit low and unfocused it’s often due to tiredness. If this is the case, give yourself some time to switch off for a while and recharge. If you want an immediate solution, you could take a short walk, head to the salon for a pamper, meditate, head to the gym or take a bath and have a nap. Or, if you need more time to relax, you may decide to go away with some girlfriends for a weekend, sign up for a relaxing retreat, or head to the spa for a day. Whatever you choose, make sure it’s something that you will enjoy. Commit to giving your mind the opportunity to switch off– and don’t feel guilty, self-care is vitally important! When you have a ‘down day’, one of the worst things to do is to crawl back under your duvet and wallow in it. However, talking things through with other like-minded people can be a great way to start feeling better. Go and hangout with friends, contacts or colleagues and discuss your current lack of motivation. You’ll most likely find comfort in knowing that you are not the only one who goes through times of doubt and come away feeling better about everything - and possibly even refocused and motivated again! When we have a wobble moment, it’s easy to dwell on all the ways we feel we are not good enough, all the skills and knowledge we don’t have and all the mistakes we have made. Of course, this is definitely not going to help our mood! Taking some time to be grateful for all the good things and opportunities in your life, however, is a great antidote! Say out loud, note down on paper, or write in your journal all the things you are grateful for and you’ll soon see your mood and outlook change for the better. A fresh dose inspiration is the perfect medicine on those days when you're suffering from self-doubt or a lack of motivation. Sign up for a workshop or webinar to build or refresh your skills, watch an uplifting video, or read an inspiring book. When I say ‘Take Action’ I mean any action. Doing ‘something’, even if its not related to your current work or issue, can help you break out of your current mood and get back into a more productive space. Improving one area of your life – even if it’s something as small as having a beautifully organised sock drawer – can have a positive knock-on effect on the rest of your life. So think out of the box and achieve ‘something’ today. 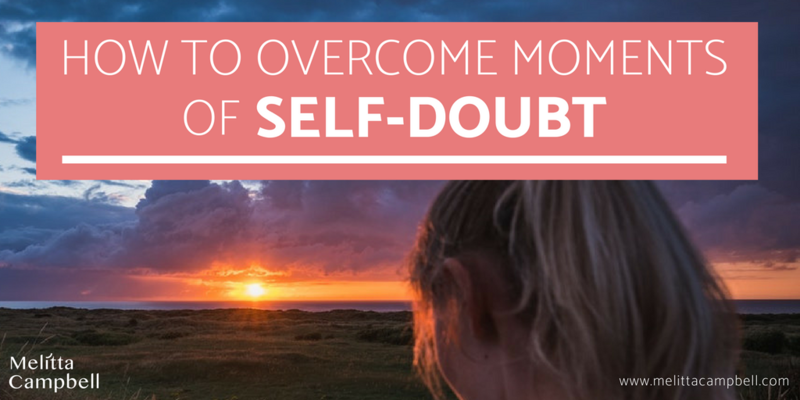 Have you tried out any of these tips for overcoming self-doubt? Or perhaps taken a different approach? I'd love to hear your experiences - take a moment to share them in the Comments section below! Ever wondered about starting a part-time home business? I help women start their own home business in the health and wellness sector. With a proven business model, market-leading products, a global opportunity and free training and personal coaching, you have everything you need to succeed and continually grow with your business - even if you have no prior experience and only have a few hours a week to spare. Get in touch for more information about how we could work together. Thank you for such a lovely article! We all struggle with self-doubt at one point or another. 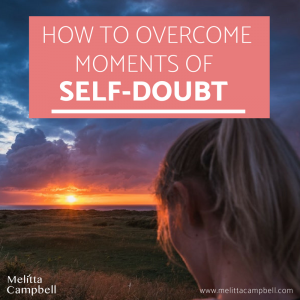 Self-doubt is the number one mindset block my clients come to me with – and I believe it’s the number 1 killer of dreams. I totally agree! And as you say, it’s often in our minds and has nothing to do with reality. We are capable of far more than we often dare to allow ourselves to believe – it’s time to chase down those dreams! Great tips! Something that helps me when I feel self-doubt creeping up on me: I think about the worst possible scenario. Sounds counterintuitive, but it works. When you’re paralyzed from having to make a decision, ask yourself: “What is the WORST thing that could happen if I decide to do this?” The answer is nearly always something really silly or trivial. Removes fear from the situation! That’s a great tip, thanks Patrick! You’re right, when you think things through logically, the ‘worst’ isn’t always that bad and is highly unlikely to even happen. Oh thanks yes. These are things that keep me going pretty much. Usually meeting friends heps you to remove the stress and move on. And new plan always works. Thanks for sharing your experiences Alexander! I love that Selana – gratitude is so powerful and yet easy to incorporate into our days. I love the idea of sharing your gratitude on social media so you can look back on them easily, that’s a great tip! If you have time, take a look at my post sharing some of my favourite videos on positivity. There’s a link to David Steindl-Rast’s TED talk on gratitude that I think you’ll enjoy. What helps for me, is to do yoga. Do some breathing exercises to bring fresh air into my brains; bend and stretch a bit to focus my mind on something else. It does wonders for my self-confidence, somehow. Thanks Sandrine. Yes, I agree yoga and breathing are great for helping you get your positivity and perspective back. I recently learned Tony Robbins’ priming technique which is also great. Thanks for sharing your experience! I love all of these, particularly taking time out and using a gratitude journal! We all have moments of self doubt so these tips are really beneficial Thankyou! You’re welcome Lauren, I’m so pleased you found them helpful. This is a great article. I can really relate to ‘wobble moments’ (love the term, btw). I’ve been having quite a few lately and all of these tips are great ways to get past them. I really like the suggestion to just do ‘something’. Sometimes feeling accomplished in a small thing (yeah, I got the laundry done today!) gives us the motivation to tackle the next task. Love the term ‘wobble moment’, sometimes when I go back and revisit the goal, it has changed to a different focus. Great advice! Great idea to give an idea some space and then revisit it later, thanks Amy. It’s like the ‘fairytale’ technique of revisiting stories and lessons often, as every time you do, you take a new message away as you’ve achieved growth and development in the meantime. These are great tips! It’s so important to stop self-doubt in in tracks! Beautifully written! I agree on everything listed here! Do not let the negatives ruin you! I’m a silver lining girl. There’s always something good to be found. Hold onto that one good thing and keep reaching for more. That’s my survival strategy. Great job putting together an action plan. I may just be the queen of ‘wobble moments’! I find that ultimately what gives me reassurance when I face moments of self-doubt is to indulge in a little exercise that I learned several years ago, in a ‘7 habits of highly effective people’ training. I picture myself, at the age of 80 and ask if I had any regrets in life, and what I would have done differently. This has always helped me take decisions, and be confident in whatever I do, be it my running my websites, or any other personal or professional venture. Thanks for sharing, Melitta. I love that idea of taking some exercise and reflecting back on how you will feel about something in the future. I mentioned that technique in my post about decision making (https://www.melittacampbell.com/dayone/), it’s really simple but effective technique! Great advice, thanks for the tips! I’m definitely plagued by those self-doubts too and it really helps me to stick back and remember the ‘why’. I’d also like to start a gratitude journal, seems like a great way to keep centered and grounded! Fantastic goods from you, man. I’ve understand your stuff previous to and you are just extremely wonderful. I really like what you’ve acquired here, certainly like what you’re stating and the way in which you say it. You make it enjoyable and you still care for to keep it smart. I cant wait to read far more from you. This is actually a great website. Wow, thank you Rashad – I’m blushing now! But seriously, I’m so pleased you’ve found my posts helpful and interesting – thanks for taking the time to share your thoughts. My family and I really love your site and find most of the content to be what precisely I’m in need of. Do you offer guest writers to create articles for you? I would not mind producing a post on omega xl or even on most of the things you are writing about on this site. Cool information site! Thanks, I’m so pleased you and your family enjoy the site. That’s normal – but hang on in there Miki! Wishing you every success with your new venture. I ´ve always struggled with self-doubt. Now, living in Switzerland, it´s become worse (Haven´t I caused any faux-pas? Hasn´t there been any misinterpretation? Do they accept me? etc.). That´s why I started journaling my little daily successes on this field and it really helps.